Because you harvest zucchini when immature, this summer squash contains fewer nutrients than mature winter squashes that develop large stores of starch and sugar. As with cucumbers, most of the weight of a fresh zucchini comes from water. Zucchini provides good flavor and only a few calories, whether raw or cooked. Zucchini offers useful amounts of some vitamins and minerals, but cooking reduces its nutritional value. Growers cut zucchini only days after the fruits pollinate. Tender zucchini squashes need no cooking. One raw baby zucchini weighing 16 g contains only 14 calories and yields about 1 cup of sliced or grated raw zucchini. The squash holds 0.2 g of tender fiber, 0.5 g of carbohydrate and 0.43 g of protein. 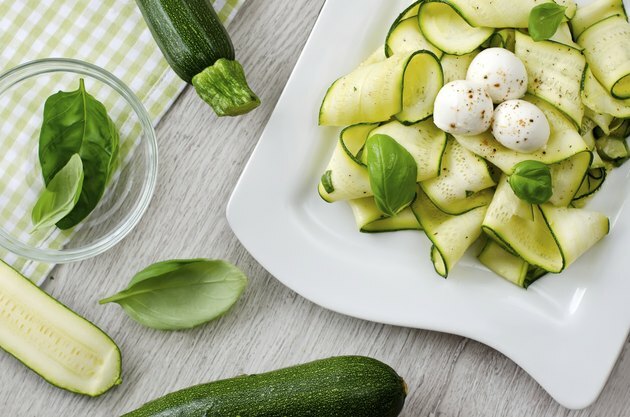 Sixteen grams of zucchini provides 73 mg of potassium and 15 mg of phosphorus, with 5 mg of magnesium and 3 mg of calcium. You gain 5.5 mg of vitamin C from a large baby zucchini and 78 IU of vitamin A. Zucchini contains traces of many other essential nutrients. Over 90 percent of a zucchini squash consists of water. Cooking releases some of the water and leaches or vaporizes some nutrients. Boiling zucchini in salted water removes more protein than carbohydrate and reduces the total energy content to 10 calories. Zucchini loses more than one-half of its potassium and one-third of its phosphorus through boiling. Magnesium content drops to 3 mg, and calcium remains stable at 3 mg. Boiling reduces vitamin C in zucchini by more than 50 percent, but increases vitamin A. One 16-g boiled baby zucchini contains 179 IU of vitamin A, according to the USDA National Nutrient Database. Choose only the freshest zucchini to serve raw. Zucchini should have a firm texture and no soft or brown spots. Any bruises or cuts shorten storage life. Storing zucchini in the refrigerator in a perforated plastic bag keeps the squash fresh for up to three days. Trim off the blossom end and stem, but don't peel the zucchini. Cut into sticks or slices, zucchini goes well with salads or by itself with dips. Any fatty dip or dressing added to zucchini contributes more calories to the meal than the zucchini does. Low-calorie dips, hummus or vinegar-and-oil dressings add flavor without the extra calories of high-fat condiments. Flavorings contribute both calories and nutrition to cooked zucchini dishes. The 2 cups of chopped zucchini in "Lemon Rosemary Zucchini" contain only 32 calories. Adding 1 tbsp. of olive oil for sauteing this mixture of zucchini, bell pepper and herbs increases the calorie count to 184. Baked zucchini requires only enough oil to slightly grease the baking pan. Combining tomatoes, onions and seasonings with the sliced zucchini adds flavor without greatly increasing calories. One serving of this baked vegetable medley provides only 31 calories and 32 percent of your daily vitamin C, according to the University of Maine Cooperative Extension. How Many Calories Are in Kabocha Squash?